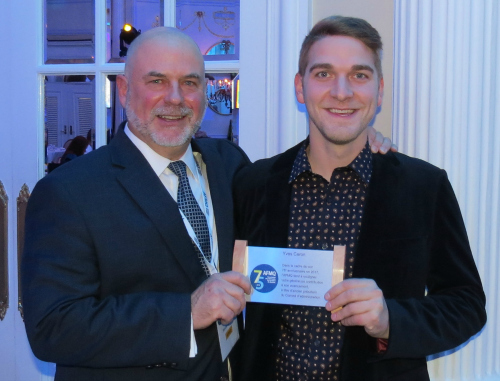 QFMA president Pierre Richard (left) is seen here with Alexandre Paquette of Trica Furniture, who was elected to the association’s board of directors are its recent annual general meeting. MONTREAL – Alexandre Paquette was elected to the Quebec Furniture Manufacturers Association board of directors at its recently-ended annual general meeting and conference. Paquette is director of finance and administration for Trica Furniture, the Saint-Jérôme, Quebec-based manufacture best known for its assortment of bar stools and seating. He succeeds Claude de Lanauze of Hettich, who served on the board for a number of years. René Vincelette, vice president of human resources for contract furniture maker Groupe Lacasse. Directors are elected for one year terms. Réjean Poitras is the current chairman of the QFMA board of directors. David Gélinas is vice chairman.